Spinning Flagpole for residential use complete with Adjustable Bracket. Silver or White Finish Flagpole. Flag Sold separately. 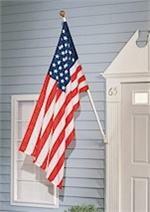 Order a nylon or polyester flag from our site. EZ MOUNT FLAG MOUNTING RINGS 1 INCH, CLEAR PLASTIC, SECURES FLAG TO FLAGPOLE.